Lanyards have become a staple in today's business attire. As security in most buildings tighten, the use of ID badges increases. Being required to wear these ID badges at all times in prominent places has made the lanyard or badge holder a necessity for all types of businesses. Creating a holder that looks relatively stylish while maintaining the safety aspects of them has challenged crafters to come up with something that reflects a person's personality. Lanyards created from beads, crochet and ribbons are becoming the new fashion statement. Ribbons are specially popular because of the wide variety of colors and their easy use. Assemble your materials. Your ribbon choices can be as far reaching as the variety available. You want to pick 3 different ribbons, either complementary or contrasting colors, including patterns, if desired for extra interest. The ribbon width should be no more than 1 inch wide. The cone jewelry finding should complement the color of your ribbons. 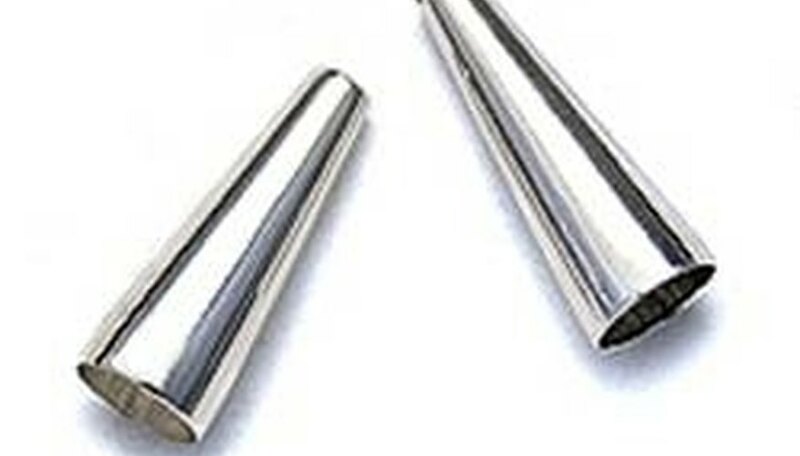 Most cones come in base metallic colors of gold, silver, pewter and copper. The same can be said of the magnetic clasp and the jump ring/toggle clasp. 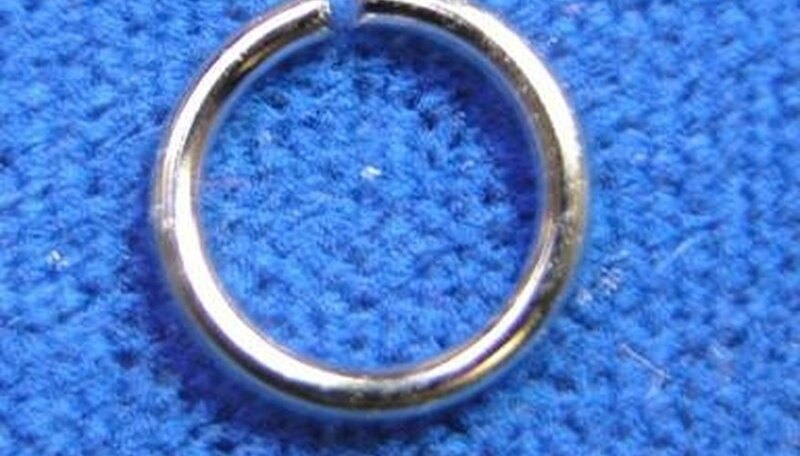 You will be using only 1/2 of the toggle clasp, specifically the closed loop half. Use of a toggle can add interest to your lanyard, as they come in many different styles. The 26-gauge artistic wire also comes in many colors and can be chosen to complement the design of your lanyard. Cut your ribbon. Measure and cut a length of ribbon that is about 4 feet long from each of the 3 kinds of ribbon you chose. 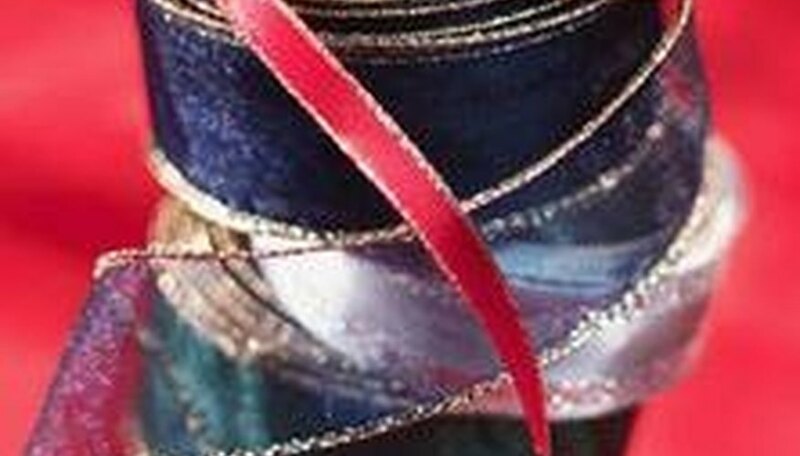 Place a small amount of tacky glue on one end of each strand of ribbon, from the end to about 1 inch up from the end. Place the 3 ribbons together, removing any excess glue. Allow to set. Braid the 3 ribbon strands until you have a length of braided ribbon approximately 14 inches long. This will make a 28-inch long lanyard. If a longer lanyard is desired, increase the number of inches. Place the jump ring or toggle clasp on 2 of the ribbon strands. Braid the ribbon so that the ring is firmly attached to the lanyard. Continue to braid the ribbon until you have achieved the desired length. In the case of this sample, that would be another 14 inches. Glue the finished ends of the ribbon together. Make sure that you have approximately 1 inch of glued area after your last braid. The end should match the beginning section. Cut 2 lengths of wire about 12 inches in length. Leave a tail of wire of about 2 inches close to the braided area. Begin to wrap the wire around the 1-inch glued section, making sure it is pulled tight. Once you have reached the end, slide the cone finding over the top. Place half of the magnetic clasp on the wire. Loop the wire through the clasp a couple of times to secure it. Pass the wire back through the cone, pulling it tight. Pull the wire straight through the cone until you reach the tail of wire you left. Twist the two ends of the wire together, wrap any remainder around the already wrapped section, and tuck it back up into the cone. To finish securing, take the magnetic clasp and twist it twice. This will twist the wires together inside the top of the cone. Repeat on the other side and wear.